Given that we’ve been talking lately about collisions and water-delivering impacts in the early days of the Solar System, it’s a natural enough segue to today’s work from the Southwest Research Institute (SwRI) on how the planets themselves may have moved about in that era. We also need to talk about the upcoming Lucy mission, which targets two interesting bodies: Patroclus and Menoetius. 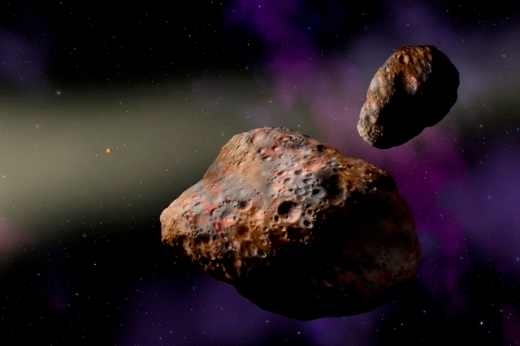 Both are approximately 112 kilometers wide, comprising a large binary among the Trojan asteroids, which move in leading and trailing orbits around Jupiter. 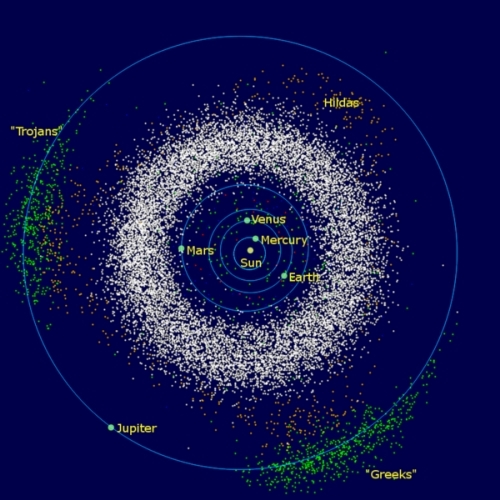 Image: Jupiter’s extensive Trojan asteroids, divided into ‘Trojans’ and ‘Greeks’ in a nod to Homer, but all Trojans nonetheless. Credit: “InnerSolarSystem-en” by Mdf at English Wikipedia – Transferred from en.wikipedia to Commons. Licensed under Public Domain via Commons. Nesvorny has already examined the period of planetary migration in a 2012 statistical study analyzing the early Solar System in terms of four, five and six giant planets, deducing the likelihood that Jupiter’s encounters with a Neptune-class planet caused Jupiter to move inward (perhaps a fraction of an AU) even as Neptune migrated outward. Earlier work has seen these events as being associated with the Late Heavy Bombardment, 4.1 to 3.8 billion years ago. The new paper argues for a much earlier period of migration, with the Patroclus-Menoetius binary forming in a once massive planetesimal disk beyond Neptune. Image: SwRI scientist studied the binary asteroid Patroclus-Menoetius, shown in this artist’s conception, to determine that a shake-up of the giant planets likely happened early in the solar system’s history, within the first 100 million years. Credit: W.M. Keck Observatory/Lynette Cook. The Lucy mission to study Patroclus-Menoetius comes out of SwRI, with Harold Levison as principal investigator, and is part of the broader investigation into the development of the Solar System. Nesvorny’s work draws on recent work on how small bodies like this binary emerged, with indications that the early Solar System was a place where binary formation was common. Co-author William Bottke at SwRI points to binaries in today’s Kuiper Belt and contrasts their presence with the relatively few that now exist within the orbit of Neptune. What do we make of the difference, and how can we use it to put Patroclus-Menoetius in its proper context? The researchers think the very existence of the binary Trojan offers information about the chronology of planetary migration. The longer the period of instability was delayed, the more likely that small body binaries in the primordial Solar disk would have been disrupted by collisions, affecting how many binaries would be captured in the population of Trojans. The evidence, then, points to early instability rather than a delay of hundreds of millions of years. The outer planetesimal disk at 20-30 au, in which the P-M binary formed, is thought to have been massive (total estimated mass Mdisk ≃ 20 M⊕, where M⊕ ≃ 6 × 1027 g is the Earth mass), as inferred from planetary migration/instability simulations, slow migration of Neptune required to explain the inclination distribution of TNOs [Trans-Neptunian Objects], and the capture probability of JTs [Jupiter Trojans]. The massive disk was subject to intense collisional grinding by impacts between planetesimals. The survival of the P-M binary in such a hostile environment is an important constraint on the disk lifetime, tdisk, defined as the time interval between t0 and the start of Neptune’s migration. Assuming a 100% initial binary fraction, and adopting the 72% dynamical survival probability computed previously, we find that having one P-M binary among the 25 largest JTs with D > 100 km would be a < 0.002 probability event if tdisk ≥ 400 Myr. The long-lived disks can therefore be ruled out at the 99.8% confidence level. Because simulations of the survival of Patroclus-Menoetius indicate that the planetesimal disk had to have been dispersed by migrating planets within ≲ 100 Myr of the dispersal of the protosolar nebula, there is found to be no linkage between planet migration and the Late Heavy Bombardment. As I mentioned, Harold Levison, who is a co-author on this work, is also the principal investigator of the Lucy mission, which will launch in 2021 and reach the Patroclus-Menoetius binary in 2033. Three imaging and mapping instruments comprising a color imaging and infrared mapping spectrometer, a high-resolution visible imager, and a thermal infrared spectrometer can then be put to work to study the physical properties of these interesting relics. This is an interesting mission profile, by the way. Lucy will head first for the L4 Trojans, which orbit 60° ahead of Jupiter, where it will study four objects, 3548 Eurybates, 15094 Polymele, 11351 Leucus, and 21900 Orus. A return to Earth and subsequent gravity assist will then take the spacecraft to the L5 Trojan cloud, trailing Jupiter by 60° in its orbit. There, it will study Patroclus-Menoetius, along the way making a flyby of the non-Trojan main belt asteroid 52246 Donaldjohanson, which is named after the discoverer of the famous Lucy hominin fossil. The term ‘hominin’ takes in modern humans but also all extinct human species and ancestors. 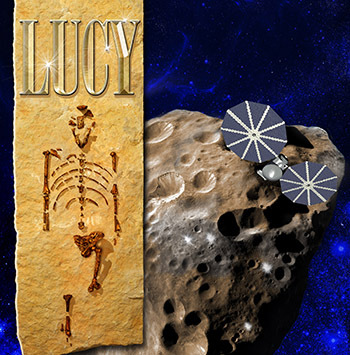 Image: A mission emblem for Lucy, which will study primitive asteroids orbiting near Jupiter, showing the team’s interest in the Lucy hominin skeleton as an example of the earliest period of humans, a study the spacecraft is intended to duplicate for the earliest era of Solar System formation. Credit: SwRI. The paper is Nesvorny et al., “Evidence for very early migration of the Solar System planets from the Patroclus–Menoetius binary Jupiter Trojan,” Nature Astronomy 10 September 2018 (abstract / preprint). Any chance that Lucy could pay a visit to that “wrong way” Jovian moon? I cannot help but recall how Clarke suggested that Iapetus was a clear blinking signal of something special in Saturn’s orbit. In that fictional case, where the big brother monolith lay in wait for its task. Now we have that (413107) 2015 BZ509 asteroid that is clearly indicating its special significance in a perfect 1:1 retrograde resonance orbit with Jupiter…. Indeed it is by the study of outliers and oddballs that normative concepts are grasped: “the exception proves the rule”. Such outliers should command attention to the extent feasible. The B-Zed case is interesting – and also a contrast to what is described here. In the case of B-Zed the authors argue that the 1:1 Jupiter resonance has been around as long as the solar system – and yet here and elsewhere it is argued that Jupiter did some migrating itself (inward by a fraction of an AU as Neptune migrated outward). So we are to believe that B-Zed did this two step as well? … No? Then perhaps it arrived somewhat later – and that opens a whole new ball game of it arriving at any time with mechanisms yet to be provided. explanation. Additionally, the above argument of instabilities disrupting asteroid binaries would likely affect a Jupiter retrograde resonance. It would be hard to visit or examine a Jupiter resonant retrograde asteroid, but I think the discourse above provides reason for it to be a more enigmatic Solar System feature.